Since posting photos and stories from the first three days of our last photo safari in Tanzania, I have had many people ask about future trips. I wanted to write a quick blog post for all of you to see what upcoming trips we have for 2018 and 2019. This trip is scheduled for next month and we still have openings! Contact me immediately to join us for this trip, which is right around the corner. 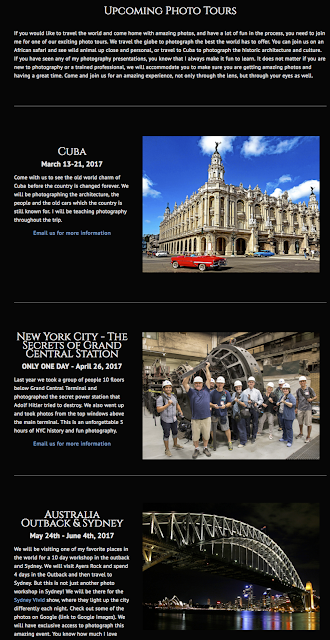 A one-day workshop visiting the hidden areas of Grand Central Terminal. We are going to photographing in the outback as well as doing night photography in Sydney. We are going to be getting up close and personal with the gorillas! Come with us to photograph the bears and landscape. Join us as we travel around Japan and capture the landscape and architecture. Another trip to Africa, but this time to photograph san dunes and animals. We will be making our third trip to Tanzania in early 2019. You can find more information on the upcoming trips by clicking HERE. All of these trips are open to anyone, regardless of your level of photographic experience. I can teach all levels of photography, from the beginner to the pro. And...we often have people come along who are not photographers, but want to see the best each area has to offer. The only thing we require is that you have fun!